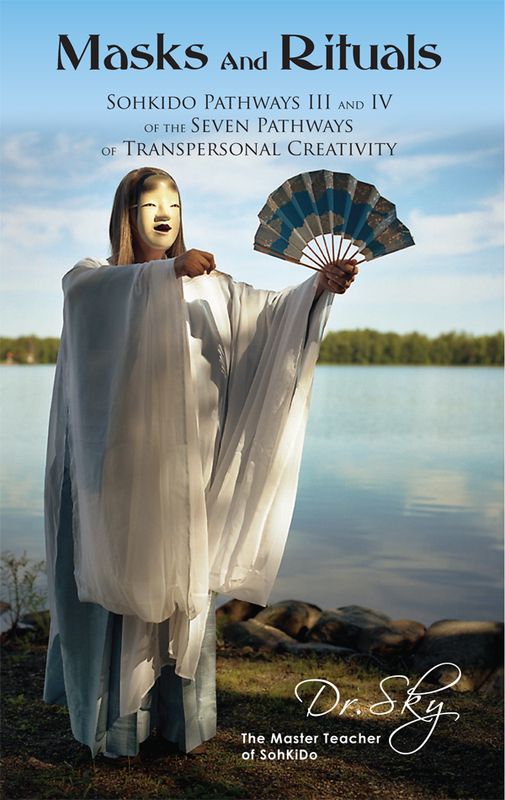 The third volume in Dr. Sky’s inspiring five-part SohKiDo® series, exploring the arts and transpersonal creativity introduces Pathways III and IV: Masks and Rituals, and also offers a historical review. In this book, Dr. Sky explains first, the third pathway of her innovative SohKiDo method, which taps into the ancient magic of the transformative powers of masks. Masks enchanted Dr. Sky’s imagination when she was introduced to masked pantomime during her theater studies in Helsinki in 1967. Her fascination was rekindled when she saw the Noh Theater performances in their Japanese ambiance in Kyoto, Japan in 1972. In this volume, the Rainbow Method with its myriad of creative masked improvisation techniques evidences its authentic decades-long development. Mask making techniques and mask making as a diagnostic tool is offered to stimulate further research. Inspired by Dr. Sky’s own Finnish heritage of the mythological epic of Kalevala, the fourth pathway of SohKiDo, rituals, explores the participants’ personal mythology. They include Positive Affirmation Chanting, the Prism Ritual, the Seven Stages of Womanhood Ritual, and Forbidden Tears Ritual, in which individuals at all levels of ability can embark on a spiritual journey. “Unmasking,” coined by Dr. Sky, is an innovative concept offering insight into Individuals with Differing Abilities and their methods of mirroring and modeling as teachers of patience, unconditional acceptance and unconditional love. Masks and rituals offer Transpersonal and authentic methods that can be used as adjunctive devices with, or as alternatives to, traditional and clinical methods. Using discoveries from Dr. Sky’s own creative and spiritual journey, Pathways III and IV: Masks and Rituals will inspire you to access the healing powers through SohKiDo and its life-changing insights into spirituality, creativity and the self.